The Welkin Suite helps you to cover more of the routine tasks by just a single mouse click. You can manage all of the static resources from your Salesforce project directly in the IDE. Save tons of time and always have all the necessary tools to reach your goals! To get access to the ability to manage the static resources, navigate to the Main Menu: View ⇒ Static Resource Bundles Explorer. In this panel, you can find the list of all the static resources from your project(s) and all of the included items for zipped ones. To review all the items in the zipped archive, just expand it by clicking on the arrow next to the archive's name. To collapse all the expanded items in one click, use the Collapse All button at the top of the panel. You can open any file in the editor with a simple double-click. 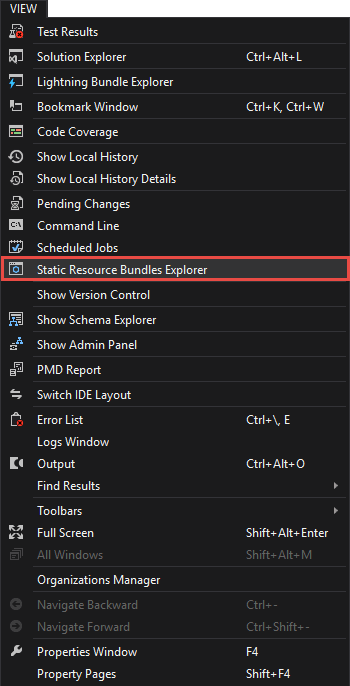 You can add a new static resource right from the Static Resource Bundles Explorer. To do so, select a project item or any zipped static resource in this panel, then click on the Add button at the top of the panel, and select the Add New Static Resource option. After completion this action, you'll get the opened wizard of the creation of a new static resource. 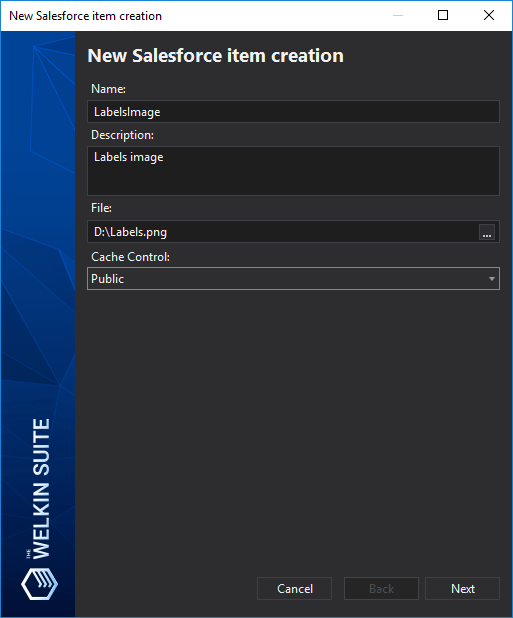 Enter a name of a static resource, its description, specify a file, and select a cache control option. When you press the Next button, the IDE will create a Static Resource on your Organization and download it, so it will be immediately available in both the Solution Explorer and the Static Resource Bundles Explorer panels. Add Existing Folder — it provides you with an option to select an existing folder on your file system to include it (and all files and folders in it) into the Static Resource. Delete — it removes a file or folder from a Static Resource or a Static Resource itself from the organization. Additionally, you have an option to Open in browser that is available in the context menu for any Static Resource — this фсешщт will redirect you to the appropriate Static Resource edit page in your Organization. The Solution Explorer panel and the Static Resource Bundles Explorer panel are both independent, so drag&dropping items in the Solution Explorer won't change anything in the Static Resource structure. 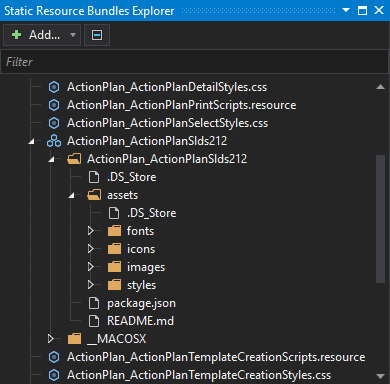 If you need to move items in the Static Resource Bundles Explorer, simply drag & drop files and folders inside the Static Resource to get the needed structure. NB: When you do any changes to the structure of a Static Resource, the content would be first reflected in the %project_folder%\resource-bundles\%static_resource_name% folder, while changes in the related zip file itself will be available after performing a build. At the same time, these changes won't be reflected in the Solution Explorer (so, if you're using project structure sync, it won't be updated as well) unless you build your changes. Also, if you move any files that are included in your Static Resource in the Solution Explorer (thus customized the project structure) and then you change the structure of this Static Resource, the IDE won't change the location of that files in the project structure.